This is one of those very rare perfect picture books that makes you laugh, moves you, and leaves you thinking about it for a long time after closing the book. It is simple and fun at the same time as exploring a problem that almost anybody, big or small, can relate to; the problem of being the odd one out. 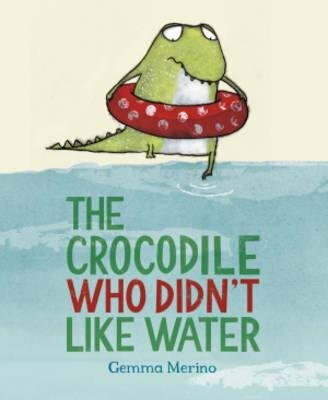 The little 'crocodile' of the title doesn't like water as his siblings do. The bliss and excitement on those siblings' faces as they play water volleyball, jumping off trees into the water, and even synchronised swimming is in wonderful contrast to the terror and loneliness and determination of our little crocodile protagonist. He does his very best to join in, being brave, and saving his pocket money to buy a rubber ring, but it doesn't work. He just gets cold and miserable ... and that cold leads to a magnificent sneeze of fire that proves that he isn't actually a crocodile after all; he's a dragon! Now that he knows what he is, he's happy. He takes his siblings ballooning and flying on his back, but there's more. The opening and closing images of this book are wordless but tell so much. The opening image is of a basket of white eggs and one blue one. The last image is of a nest made from the rubber ring, and inside that nest are lots of blue eggs ... and one white one. The odd one out problem moves on a generation! Gemma Merino has been very clever with this book, playing with different layouts on each spread to pace the story and milk the drama and humour. Amazingly, this is her first ever book, developed from work done on an Anglia Ruskin MA course in children's book illustration. This book is, deservedly, winning prizes, and I can't wait to see more from this Spanish architect turned children's book creator.